The web has been part of politics for some time. During the 2004 presidential campaign, Democratic Gov. of Vermont Howard Dean made effective use of Meetup, Inc. to organize meetings and used his website to gather donations. Almost all of the campaigns also started blogs in 2004, and many of their supporters created specific issue blogs. During the current election cycle, online campaigning has become a defacto requirement. Some candidates, such as erstwhile Massachusetts governor and Republican presidential candidate Mitt Romney, have even employed tools such as salesforce. com to manage the donation process. The presidential campaign of Sen. Barack Obama, D-Ill., has gone a step further and uses Web 2.0 tools to further engage its participants in campaign work and to better understand the issues that are important to voters. In the beginning of 2007, as the Obama campaign began to receive tens of thousands of emails, the organization needed a way to respond to the dramatically increasing influx of communication. It approached the on-demand service, RightNow Technologies, for CRM help. RightNow positions itself as a CRM tool from the customer’s perspective, while many other CRM vendors design their tools from the salesperson’s perspective—a philosophy that happens to jibe well with the themes of the Obama campaign. Colin Jones, the RightNow project manager for the Obama effort, said that RightNow constructed two tools for the campaign. The first was an email response system, Invite Barack, developed in 2 weeks to handle nonmedia requests for Sen. Obama or members of his campaign to attend local events. Users fill out an online form that goes to a work queue with a team assigned to properly acknowledge and respond. In addition, the system allows the campaign to monitor trends in requests such as location, requesting organizations, outcomes, and so on. The more comprehensive of the RightNow initiatives is the Obama Answer Center, in which visitors can search and browse through answers to frequently asked questions about the candidate. The site uses the standard RightNow template for answer centers, so it will be familiar to users who have visited answer centers at, for instance, the Environmental Protection Agency, Electronic Arts, and Nikon. Users can search questions by category and keyword, browse the most popular answers, and submit questions that haven’t yet been answered. Because the system captures all the actions and inputs of people who participate, the Obama campaign is able to use web analytics to sort the most popular keywords and questions by region to better understand the concerns of people in different parts of the country. This allows for more targeted ads and other messaging, but more importantly it provides another perspective on the issues that are important to voters. The campaign can also examine the questions that have been rated most effective and least effective in order to improve the quality of the answers. 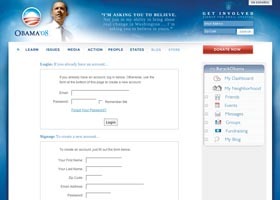 The Obama campaign has invested in many other web efforts. Central Desktop helped the campaign build a precinct captain website that recruited, trained, and gave tools to thousands of volunteers in California and Texas. The My Barack Obama site allows supporters to build their own profiles and connect with local supporters, find or create a local or national group, create a personal fundraising page, find events or plan their own, and record their campaign experiences on their own blogs. The collection of Web 2.0 technologies being employed by the Obama campaign comprise a template for what political campaigning may look like in the future at all levels of government. Obama’s campaign has thus far shown that the web can enable greater participation in the political process and, hopefully, the process of government.